Protein homeostasis is essential for the survival of cells. It is closely related to the functioning of the ubiquitin-proteasome system, which utilizes the small protein ubiquitin as a posttranslational modifier (PTM). Clinically, the modification is of great importance as its disruption is the cause of many diseases. Unlike other PTMs, ubiquitin can encode several cellular signals by being attached as a single molecule or as a chain of several ubiquitins in various conformations. Thus, ubiquitin signaling is dependent not only on the site of attachment but also on the chain type, the so-called ubiquitin chain topology. 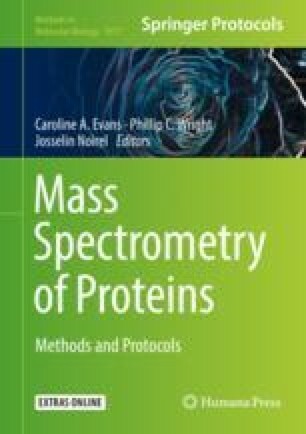 The most reliable quantification method for the chain topology uses a bottom-up targeted mass spectrometry-based proteomics technique. While similar to other targeted proteomics techniques, the measurement of ubiquitination chain topology is complicated. First, the ubiquitin chains in the sample have to be biochemically stabilized. Second, the selection of peptides for the analysis is restricted to a given set harboring the PTMs and does not allow for optimization for amenability to mass spectrometry-based quantification. Instead, the topology-characteristic peptides are fixed. We here present such a methodology, including notes for a successful application. The authors would like to thank Dr. Antoine Lesur for his helpful advice on various technical issues examined in this chapter and reviewing the manuscript.